Rockman Corner: Capcom Planning Another Legends 3 Demo? Capcom Planning Another Legends 3 Demo? It's a topic that's on everyone's mind: When are we actually going to see Mega Man Legends 3? Let alone play it? March 29's "Capcom x Nintendo 3DS" exhibition would have marked not only out first time laying eyes upon the project, but experiencing it as well. Unfortunately, the event was subject to cancellation shortly after the Tohoku earthquake and subsequent disasters that ravaged Japan. While Capcom has yet to announce plans of a reschedule, it appears there's something else in the works that will allow fans to give Legends 3 a spin, something that might be a bit more accessible. "We have something more interesting in mind... No news on this was at Captivate (intentional) but stay tuned." Indeed, Captivate turned out to be a bust when it came to MML3 news, but it appears that there is something on the burner and we should be hearing more soon. So, how would the distribution of a MML3 demo be carried out? A Nintendo Channel demo was proposed by Jimb0, but that idea was shot down -- so too was the notion of key members of this very blog and The Mega Man Network gaining exclusivity to preview a demo build. 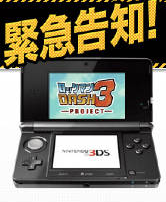 Perhaps a demo will be distributed through the 3DS' own upcoming eShop application? Seems like a likely candidate, if you ask me. We'll keep a close watch on the Devroom for future news on the topic. Stay tuned! Virtual Console demo like Star Force 3? Not E3, Mike. This demo would be something accessible. Only the press can go to E3. @first anonymous: read before you post. they just shot down the idea of getting a demo that way. And it wasn't on the virtual console it was through the Nintendo channel. So wait, the embargo on Captivate news is over? Pfff. That's not a Capcom event. @Amir: actually, for all we know, the planned demo could have used the model for volnutt in TvC and touched it up to match the games art style. Then it would be a simple matter of altering the model's shape and colour to match the new design.